There are good reasons why men like curvy bums and why most of us turn our heads to the right when we kiss - and the answers are a lot less romantic than we might imagine. Q WHY do some men smell better to you than others? Admit it - you have loved a partner's smell so much that you'd sniff his dirty shirts (we're talking natural body odour only, not cologne or other smells). At least once you've decided not to change the sheets so you could wallow in his aromatic embrace for another night. If so, it's a good sign. A man's natural scent probably has something to do with why you're with him in the first place. 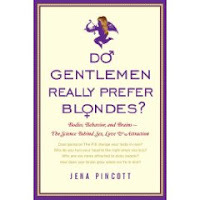 Do Gentlemen Really Prefer Blondes? by Jena Pincott (RRP s12.99) at the discounted price of s10.99 (including p&p). To order a copy, call Book post PLC on 01624 677237 quoting the reference code DR-DGPB.